When it comes to prostate cancer or other illnesses, conventional and experimental Western medicine can help us heal. But traditional medicine combined with spirituality has an even greater impact. 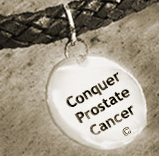 Imagine for a moment a patient who has recently been diagnosed with prostate cancer or some other cancer. After being informed of this new malady, s/he enters the doctor’s office passively waiting to hear what can be done. The doctor offers the patient a series of treatment options, citing the risks and benefits of each. If pressed the doctor might offer a sense of which treatment might be most beneficial and the odds of a successful outcome. After setting a date for the appropriate procedure the patient goes home, depressed as all get-out. Sure, you tell yourself, “I can trust in my doctor’s skill.” But at some level you’re aware that he does not have all the answers. Even s/he has to rely on factors beyond his or her control to get you through. And that’s a scary thought. What’s missing in this picture is a sense of hope generated not simply from confidence in your doctor, but from your conviction that you have an innate capacity for healing. More than anything, what’s called for is an upbeat, positive attitude. You have to know, or at least believe, that despite the curve ball that’s been thrown at you, things will all work out at the end. Why? : Because you feel your Higher Power will not abandon you, but will help you through. It’s hard to acquire this outlook on the spur of the moment, but it’s not impossible. At a time of crisis, it’s likely that you can look inward to find a spiritual dimension that will strengthen you. It’s only you who can find the wherewithal to raise your hopes that whatever setback you’ve suffered, you will eventually make it, renewed and whole again. Start by remembering you’re not alone. Remember too that others have gone down the path you now find yourself, and most have made it through with flying colors. And recall that those who’ve been with you through past crises will be with you now. Why assume the worst when, statistically, - at least in most cases, your cancer is a warning but not a death sentence? In the case of prostate cancer we’re aware that 27,000 American men a year die from what is the leading male non-skin cancer. Yet of the nearly 200,000 American men and 300,000 Europeans who are diagnosed with this disease annually, nearly 90% are diagnosed when their cancer is at an early stage. Of these men the vast majority will return to full health after the appropriate treatment. In fact, of newly diagnosed American patients with localized prostate cancer that has not metastasized, 99% will survive for at least 5 years and 92% for 10 years. After 15 years at least three-fourths will still be alive. The news is even more encouraging when you consider that 1/3 of new patients are boomers (ages 45-64) and 2/3 of patients are seniors (65 and above), who until now have led a fairly full life. Of the 10% who are diagnosed when they’ve already reached an advanced stage of prostate cancer with metastasis to their bones, one of three will survive longer than five years. So even though the odds are against that minority of new patients, there’s cause for hope. Spirituality for me is the predisposition to believe that all will be well even if an illness initially takes its toll in terms of depression, stress or pain, and anxiety about having a reduced quality of life. The power to persevere comes from within. To sum up, true healing starts with you.